Recently I have been testing a new bike bag, the Detours Ballard Market Pannier, a large shopper that easily transforms from a pannier to a tote to a backpack. 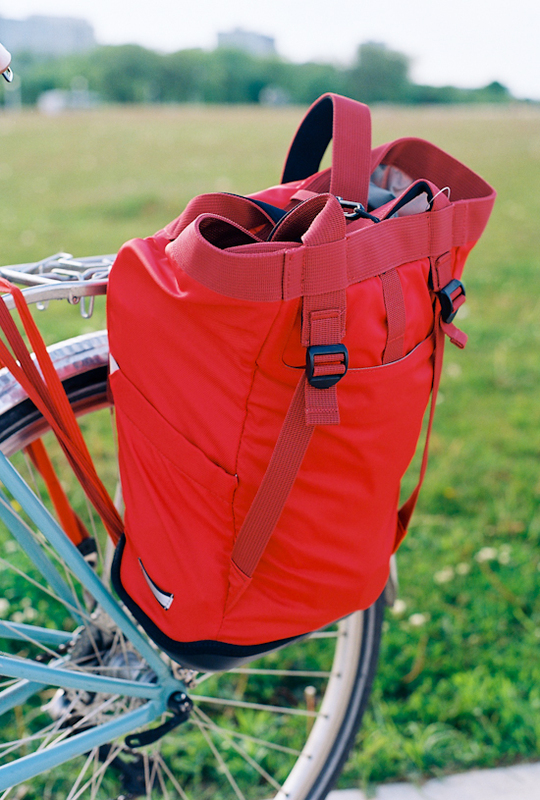 If you’re rolling up [to the market] on a bike, this is the perfect pannier to take with you. An easily hidden padded shoulder harness lets you wear the pannier as a backpack while browsing the stalls, and two simple yet sturdy pannier clips attach to your rack for the ride home. A lightweight waterproof base keeps your bag dry from street spray, and a removable rain cover protects your goods when the skies cloud over. Interior organization makes this a great option for casual office commuting as well! The bag comes in red (shown), black and “dalia print,” which is my favorite – grey with a little flower painted on front. 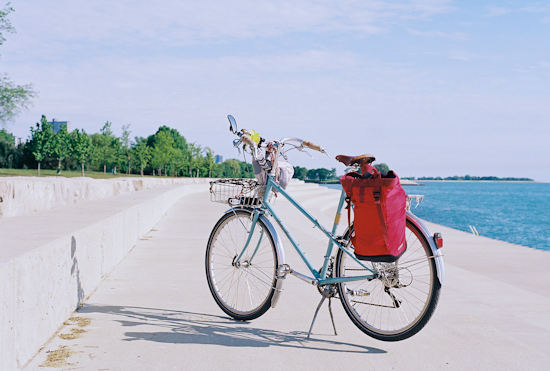 The bag hangs from the rear rack by two clamps. The system was a bit tricky on my Pletscher rack because I had to raise the rack’s clamp while attaching the bag, but once in place, the bag fit well. The large rack on my Dutch bike works perfectly with the Detours’ attachment system. The bag appears to droop a bit when loaded, but always feels securely attached. 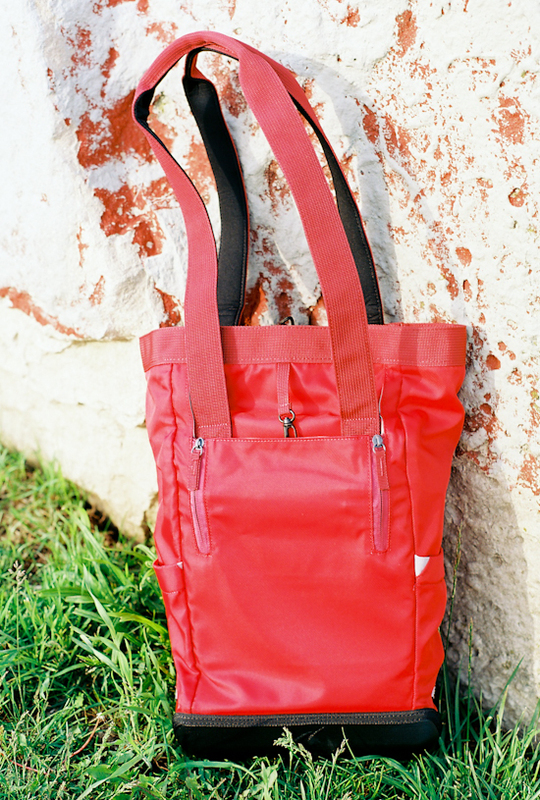 There are adjustable straps on the front, which come in handy when the bag is used as a backpack. The long handle straps are useful when carrying the bag, but they hang awkwardly when the bag is mounted and could be long enough to interfere with the wheel. I tied them together and tucked them into the bag as shown below. Another option is to tuck the straps in the front pouch, but neither solution is very elegant and I wish there were a better solution. The bag, as you can judge by its size, holds a substantial amount of stuff. In addition to the cavernous interior, there is a small internal, zippered pocket, plus three external pockets (two small on the side, on large on the front). The bag I’ve been using for years as a large shopper is my Basil Rosa-Mirte Shopper, but that bag must be hand-carried by a handle – super annoying when trying to shop and/or when carrying a heavy load. The Detours bag is not as cute, but wins over the Basil for ease of carrying with the shoulder strap and backpack option. I’d say the Detours Ballard Market is most comparable to the Ortlieb Bike Shopper that I reviewed last year. In that showdown, the Detours bag wins hands down. Both bags hold a lot and have smart and easy attachment systems, but the Detours has useful outside pockets, holds more, is easier to close, turns into a backpack and costs $30 less. The Ortlieb wins only in waterproofness. The material on the Detours is water-resistent, but the drawstring top leaves it vulnerable. A full, neon yellow water cover is included, though, so as long as you keep it in the bag, you should be good to go in storms. The Detours logo on the side of the bag is reflective, but I was disappointed not to see more. I wish companies would incorporate more reflective markings on bike bags. …which can be zipped up to hide the clamps and protect you from being poked. 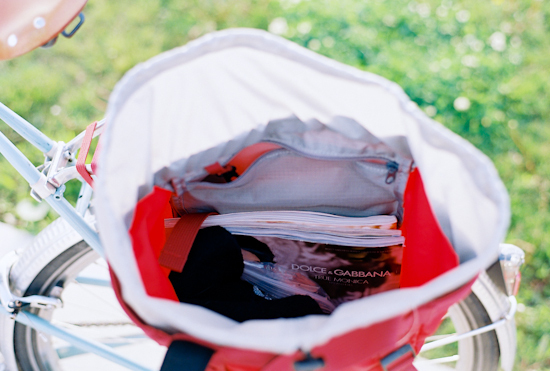 When carried, the pannier functions as a long, substantial tote bag. As you can see, it has a sporty feel. Not something I would feel comfortable carrying to important meetings or court, but suitable for a regular day at the office. For daily use, I prefer a more professional-looking bag like Po Campo. I’m not crazy about the sporty/bookbag-esque look of the Detours, which does not mesh well with my professional lifestyle. The black or “dalia print” colors are better professional options than the bright red. That said, the Ballard Market Pannier is marketed as a farmer’s market bag that could double for casual commuting, and the design is appropriate to that purpose. Overall, I like the Detours Ballard Market Pannier a lot. The bag fits a huge amount, while also being easy to attach and detach and convenient to carry, either as a tote bag or a backpack. 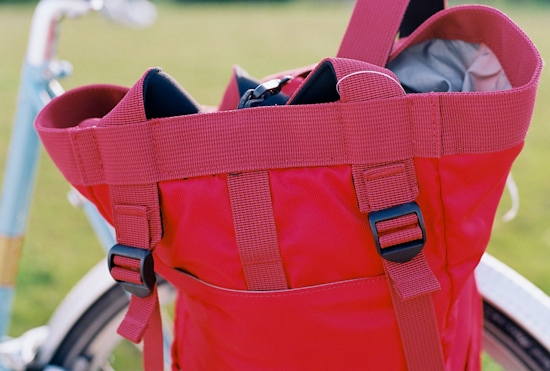 For a bike bag that are designed to carry substantial loads, the Detours is the best I’ve come across so far. And a HUGE bonus of the bag is its nifty transformation to a backpack. I did not get a photo wearing the pannier as a backpack, so please watch my video to see how easily this works. 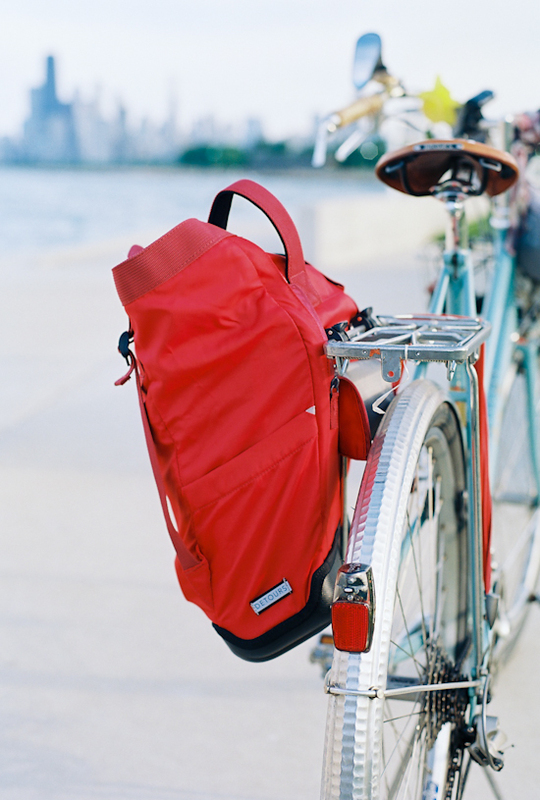 Review: Detours Ballard Market Pannier from LGRAB on Vimeo. The Detours Ballard Market Pannier retails for $69. The company is based in Seattle, and I’m not aware of any local Chicago stores that carry the brand. Carry a Load on Your Bike! On the way home from work today, I met Mr. Dottie for a bulk food run. We were fresh out of the huge jar of fancy olives! We usually don’t grocery shop by bike because we live a block from a nice store, but we will go out of our way for a great deal on peanut butter: that’s where Costco comes in. The magnitude of this trip did not come close to our last haul with the bakfiets. Since we don’t own a bakfiets, most of our trips involve a basket, panniers and a few select bulk products. Our acquisitions today included 24 bottles of Two Brothers local craft brew (on Greg’s back rack), 4 lbs of organic strawberries, 6 lbs of yogurt, 4 lbs of raw nuts, 3 lbs of chicken sausage and 2 lbs of hummus. Yummy! The bikes handled the loads perfectly. A good test ride for the bike-camping trip we’re going on with Melissa and Chanh this weekend! This is going down as a Summer Games, Part II Learning Experience: Carry a load on your bike.